Learning how to make wooden toys is a time-honored craft making a comeback. 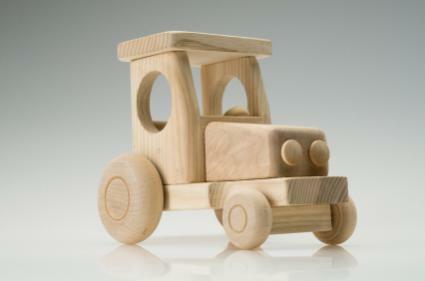 In ages past, making wooden toys was common in Europe and America where they were often created by the parents. From this point, the wooden toy industry grew to include more elaborate toys including doll houses and furniture for little girls and train sets for little boys. Wooden construction sets and a variety of vehicles were enjoyed by all. By the close of World War II, the wooden toy industry changed with the introduction of new and less expensive materials. These changes took making toys out of the hands of everyday people and resulted in a decline in their creation by hand. Today's toy market has grown to include electronic toys and toys made of modern fabricated materials. However, the popularity of wooden toys is once again growing and the craft of making wooden toys is enjoying a comeback. Why people want wooden toys differs from one person to the next. Some parents seek eco-friendly options or look for wooden toys for nostalgic reasons. It may be because they represent a simpler time when children's toys encouraged them to use their imagination and play make-believe, or it may bring back memories of a cherished toy long lost. Lastly, there is the person who enjoys working with his hands and likes the idea of making wooden toys. Plans can also be purchased online for specific toys. Wooden Toy Plans is a site that includes a large selection of full-size traceable patterns for a number of wooden toys including airplanes, cars, trucks and more. Once you select a toy plan for your project, it is important to use the right wood to create it. Hardwoods like oak and poplar work well and are less expensive than many other hardwoods and exotic woods. Another consideration is whether or not the toy will be used by a child under the age of one, or a toddler who still puts things in his mouth. If so, maple is recommended for younger children because according to Arizona Woods Crafts, there have been no allergenic or adverse reactions reported when maple is used. If you're starting out with these basic tools, be sure to check the instructions of the plan or template you will follow to see if additional tools will be needed. Creating simpler toys, first, is a great way to get the feel of creating wooden toys. Simple vehicles like toy cars and trucks are easy to make. Precut wheels can be purchased at craft and woodworking stores. Other pre-cut pieces can help create a unique toy, but remember to make a toy that is age appropriate for the child who will be using it. Small pieces can become a choking hazard for children under the age of three.